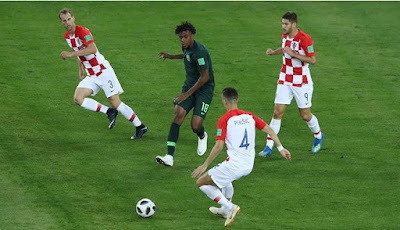 Former Super Eagles captain Austin Okocha has slammed Gernot Rohr for his poor tactical approach in Nigeria’s 2-0 defeat to Croatia in their opening game at the 2018 FIFA World Cup in Russia, reports Completesportsnigeria.com. An own goal from Oghenekaro Eteno and a penalty from Luka Modric extended Nigeria’s winless streak in opening World Cup game to four. Okocha who starred for Nigeria in three FIFA World Cups in 1994, 1998 and 2002 also faulted the team’s poor defending which led to the two goals conceded in each half. “It was a decent first half but maturity was the edge the Croatian team had over the Nigerian team,” Okocha said on SuperSport, where he was a guest analyst, after the game. “The Super Eagles got done by the movements of the Croatian team in their box. The Super Eagles midfielders were not doing their best both in defending and in attack. “Eagles didn’t geg the best out of Alex Iwobi and Victor Moses because the manager was trying to accommodate Mikel Obi in the team. “The manager didn’t earn his money today. We were not a threat in the first half and I was expecting him to play three at the back, five players in the midfield and two strikers to the team a chance to get back into the game. “It is sad because I know we can do better than this. Of course there is still hope but we have to do it the hard way now. Okocha also blamed Rohr for deploying Mikel in the creative role. “We didn’t have a creative player today,” the former Nigeria No.10 added. “Mikel has been a good servant to the national team. His best position is playing in front of the defence. We saw what he did playing for Chelsea where he had a glorious career. “The most creative player in that team is Alex Iwobi but he was played on the flanks. He (Iwobi) can play on the flanks at Arsenal because they had better players in that role like Mesut Ozil.